You have a client that started a betting pool. They need to determine how many transatlantic ship voyages ended in calamity. They really want to win and are willing to devote all resources at their disposal to win the $500 prize and a pizza. They are willing to split the pizza with you. Their resources include your wits and the internet. Very excited at the prospect of a free lunch, you dive into the task at hand. The wind has left your sails. The ocean of data suddenly seems larger than your ambition. Like a sail boat in the horse latitudes you circle around and around. You find yourself in the data doldrums. We’ve all been there before. Wearily stuck on a problem. Pouring over the same resources looking for that one detail to help you gain the confidence to put the wind back in your sails. The problem may not be the data, it may be a lack of planning. Don’t lose heart. 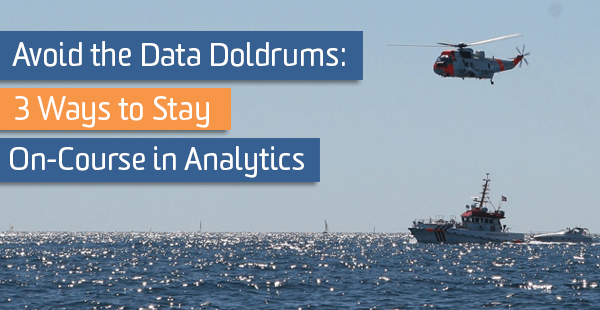 Get back on course with these three tips to escape the ‘data doldrums’. 1. Before you set sail, know where you are going. Know what questions you are NOT going to answer. These are the ever-seductive questions that are interesting, but trivial: “What’s the total value of the world’s sunken treasure?” These questions will not help you. They are the mermaid-mistaken manatees of data analysis. Don’t waste your time on them. Write those down only to avoid them. 2. Set a time to drop anchor. Establish a series of timelines to help you stay on course and avoid circling back over the same data. Set a discovery deadline of when all of your findings need found. Once you reach this deadline, anything final needs to be kept and anything inconclusive either needs to be scuttled or documented accordingly. Set a finalization timeline after your discovery. This will allow time to pull all your data points together into one cohesive gale force wind. Be sure your findings truly answer the initial question. 3. Establish an escape route. When you get stuck on a problem and are taking on water, follow a predetermined escape plan. Take a break after fifteen minutes of stagnation. This includes research and discovery. Define what your problem is and write it down. Ask yourself if spending more time will solve the problem. Return to the issue only if you have another way through it. If your problem is a knowledge gap, seek out help from someone who may offer insight. Remember, no question is too small. Be humble and fearless. You are not reflecting ignorance, but a willingness to learn and grow. Clear your mind of it. Sleep on it. You may be surprised what amazing discovery will come to you the next day with a fresh mind. You may be stuck, but don’t give up! Use your time wisely. Allow yourself to regroup and approach the problem another way. Hopefully, these principles will help you move out of the doldrums and closer to your destination. Bon Voyage!